Running 101: Do You Need an Off Season? Professional runners across all disciplines get an off season. Whether they’re choosing to compete at certain times of the year or their sport predetermines it, they are sure to take time off between seasons. For those of us who aren’t professional athletes, however, options to compete carry on all year long. You can run a 5k every single weekend if you want to but you can’t race one. If you’re just out there to get moving every time you toe the line, odds are you aren’t training at a very high level. You might run for fun. You might just run with friends. If, on the other hand, you’re an age group or contending athlete your training is intense. The more intense each training cycle is the more likely you are to need an off season. Here are three reasons why. Recover. Injury prevention is a big reason to take an off season. Our bodies cannot continue indefinitely to be beat up the way they are when we train and race hard all year long. Work load is dramatically decreased, especially running, during the off season. Both our minds and bodies need a break from the constant barrage of stimuli that come along with a hard training cycle. Repair. Take the time now to deal with any lingering issues. See that physical therapist you’ve been putting off. Get massages and take bubble baths. Build strength in the muscles that got you through race season. Eliminate weak spots and work towards strength goals that will help you run faster next race season. Plan. Goal setting is incredibly important. Use this down time to look back at how your season went. Why did it go that way? Put time and effort in determining what went well and what didn’t rather than nailing each workout. Decide what races you’ll target during your next training cycle and how to best prepare for them. Set realistic goals based on past performances. Taking an off season can be a wonderful training tool and a welcome break. It’s the time to relax and have fun while letting your body heal and prepare for the next cycle of hard work. 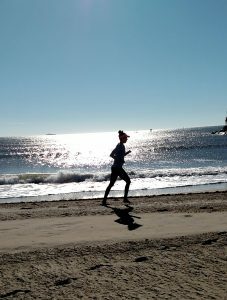 This entry was posted in Goal Setting, Injury, Mental Toughness, Racing, Running, Strength Training and tagged injury prevention, off season, racing, recovery, running, training, training cycles on September 18, 2017 by Coach Meredith.